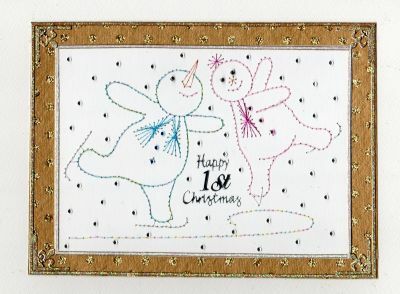 This week’s card is called Happy 1st Christmas and was made by Nette. This adorable card was made using the Stitching Cards Skating snowmen pattern. Nette said: “It was stitched on a white card, with pink, blue, copper and variegated thread’s. I used peel offs for the frame and diamante for the snow and buttons.